I love the rich, neutral tones of metal beads and pendants so much that sometimes I forget to add any color to my jewelry designs! To fix this problem, I've been experimenting with flat back crystals, which come in a huge range of colors and sizes. You only need a few to make your metal pendants, blanks, and bezels pop. Crystal flat backs often come pre-packaged in an assortment of colors, making it easy for you to try a new color combination. 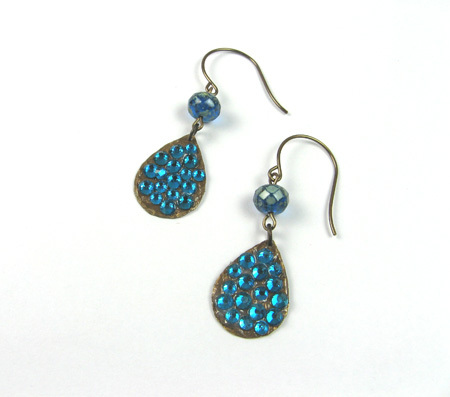 Themed pieces, such as this Rainy Day Necklace and Earring set, are not only fun to make, but easy to sell. If umbrellas aren't your thing, try flowers, butterflies, cats, dogs, keys, bats, leaves ... or anything else you dream up! 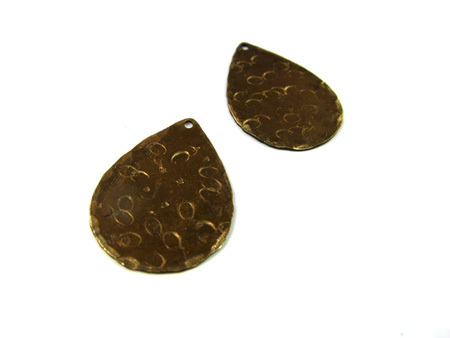 Look for pendants and stampings with channels and divots in them to guide your design or create original patterns on a metal blank. 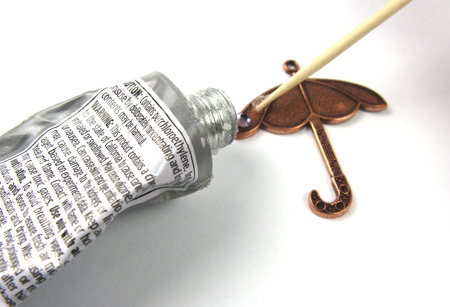 2: Working in a well-ventilated area, use a toothpick to place a tiny dot of E-6000 glue on the umbrella pendant. 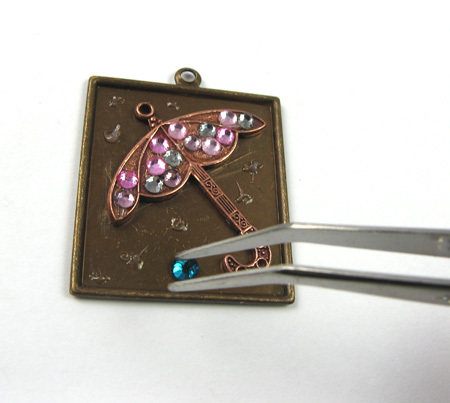 Use tweezers to help place 1 pink flat back crystal precisely on the epoxy. Repeat as needed to fill the channels in the umbrella with pink, rose, gray, and lavender crystals. 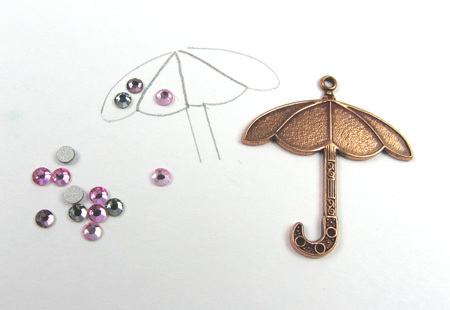 If you work quickly, you can place several dots of glue at a time on the pendant and then add the crystals. Let dry. 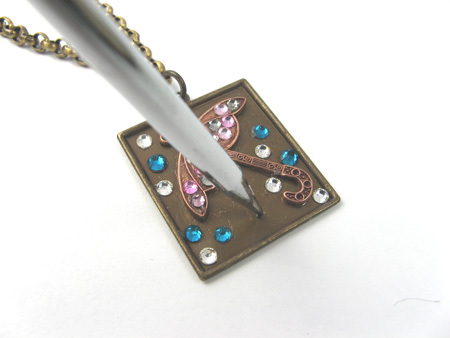 Tip: If you get excess glue on the pendant, you can use a wet wipe to remove it while it's still wet. Also, be sure to put the cap on the E-6000 if you are taking awhile to place each crystal—the glue dries quickly! 4: Use the toothpick to cover the back of the umbrella with glue and place it inside the rectangle frame. Let dry. Since both the rectangle and back of the crystals are smooth surfaces, use an awl to mark the random places to add the teal and clear crystals inside the rectangle. 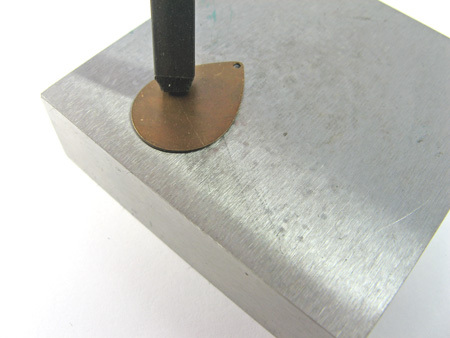 Press the awl gently to add a small dimple or scratch on the rectangle; no need to whack it with a heavy hammer! Glue crystals on top of the marks left by the awl. Let dry. 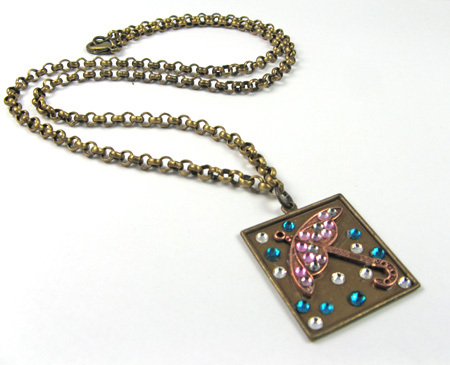 Tip: I've added the rectangle frame around the umbrella pendant to balance the chunky chain I've chosen for this necklace. For a softer look, you could skip this step and opt for a more delicate chain to hang the umbrella pendant alone. 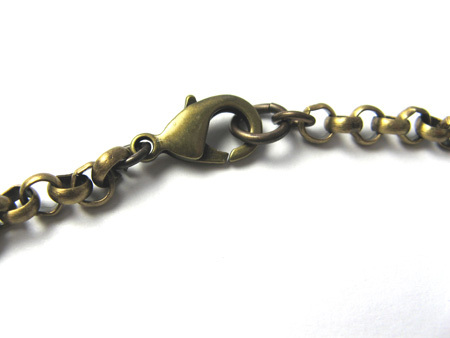 5: Use one 4mm jump ring to attach the clasp to one end of chain. Use one 4mm jump ring to attach one 7mm jump ring to the other end of the chain. 6. Fold the chain in half to find the center. Use one 7mm jump ring to attach the pendant to the center link of the chain. 1: Roughen the metal blank so that the glue will better adhere to the surface. To do this, you can use an awl (as you did with the pendant), fine sandpaper, steel wool, or metal stamps. The last method is my favorite and perfect if you are new to stamping. The stamping will be completely covered up by the crystals, so this is a great way to reuse those metal blanks you've "ruined" by misspelling or uneven hammer strokes. 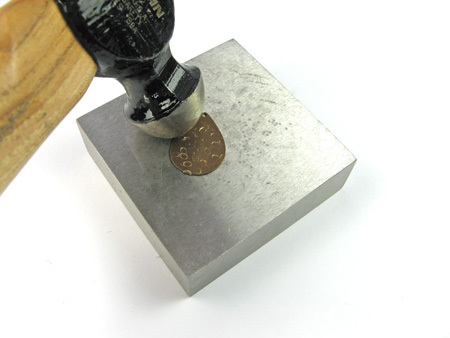 Use your heavy brass hammer for stamping and the ball-peen hammer for texturing the blank around the edges. Remember to wear your safety glass when hammering. 2: As you did with the necklace, use a toothpick to dab a tiny amount of E-6000 on the teardrop and adhere 1 teal crystal. Repeat as needed, adding a mix of teal crystals in different sizes, close together in the center of the blank. Tip: If you like, you can draw directly on the blank with pencil or permanent marker to mark the spots where you'd like to place the crystals. 3: Use 1 eye pin to string 1 glass rondelle; form a simple loop. Use one 4mm jump ring to attach one teardrop to the bottom loop of the glass link. Attach the top loop of the link to 1 ear wire.